*Don’t consume immediately after a strength training session. Anti-inflammatory foods can interfere with the adaptation to resistance training. 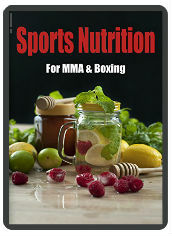 If you are training for MMA, you will no doubt be expending a huge amount of calories. Get organic ingredients if possible. Lots of organic vegetables including kale, spinach and carrots. Again, if you need to increase your calorie-intake, overnight oats are great. You can easily eat 500-800 calories in one go without feeling too bloated or ill. Ideally you’d have another wholefood-based meal at this time, but if you are working that could be difficult. About 90 minutes before I like to have 10g of baking soda in a cup of water, as baking soda (food grade) has a number of benefits and increases muscular endurance. Gingko and Ashwagandha are both adaptogenic herbs that reduce stress and increase energy levels (in most people). They are a nice, very healthy alternative to stimulants. Just go for anything with organic meat or fish, a range of organic vegetables and a source of carbohydrates such as rice or pasta. Work out if you need more calories. If you do, nuts are a good source of calories, protein and healthy fats. Pecans, hazelnuts, pumpkin seeds and peanuts are pretty tasty. You can also add some goji berries to make it a bit tastier. Firstly, make sure you get lots of natural anti-inflammatories to aid recovery. Use an hour or so after training if possible, especially if you’ve been sparring. Lion’s mane mushroom can increase neurogenesis in the hippocampus. This is probably a good thing if you are taking head shots during sparring! Consider an adaptogen such as ginseng, ashwagandha or rhodiola rosea. They can reduce stress, cortisol levels and boost the immune system when run down from training hard.